On the east border of the huge Thar Desert, with a stunning background of the Aravalli Hills, Pushkar Lake is believe to be one of the holy lakes in India. Over and over again exquisite in the early morning or delayed evening light it is positioned in the town of Pushkar in Ajmer district of the Rajasthan. 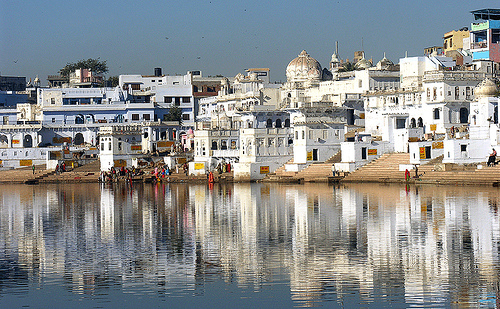 As said by Hindu belief, an offer or prayer at the temple and a sacred dip in the Pushkar lake purify all the sins and is the definite method to attain salvation or Moksha. It is too assumed that sage or rishi Vishwamitra meditated at this place. Fa Hien, the Chinese Buddhist monk during his visit Pushkar in the 5th century AD narrated his observations on the number of pilgrims.